Masterchef Australia: Secrets of the life of a real chef revealed. 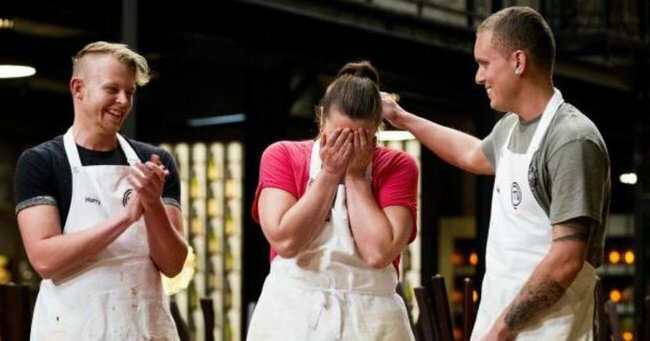 What MasterChef gets wrong about the reality of being a chef. As Masterchef comes to a close, the ever-present chef adoration seems to be at an all time high. For weeks, Gary, George and Matt have appeared on our TV screens, accompanied by a dizzying array of internationally renowned chefs and cooks. They’ve challenged contestants with mouth-watering, eye-catching, mind-boggling dishes designed to delight and astound us. Chefs have morphed into celebrities, so much so that ‘celebrity chef’ has become it’s own job description. But for the vast majority of chefs, the daily grind is extremely different to the perceived glamour. I know, because for the last three years I have dated a chef. And, like thousands of other women and men around the world, I know the being a chef is nothing like the exciting life that it seems. My partner is a chef at one of the top restaurants in the country. At 18 years old, he was staging (unpaid work) for fourteen months in one of the world’s best kitchens in Spain. And he has made more sacrifices than most would ever consider. I have seen such dedication, passion and skill from him and his colleagues. But the reality for him, for me and his family and friends, is brutal. It is missed birthday celebrations, and not having a day as a couple for five months straight. It is rarely seeing his friends, late drives home and meals at 2am. It’s leaving notes to each other because you can go days without an actual conversation. "For the vast majority of chefs, the daily grind is extremely different to the glamour projected on reality TV." Image: Channel 10. Whenever a stranger finds out my partner is a chef, their first response is ‘Wow! A chef! How amazing! I bet he cooks you the best meals!&apos;. Well, sure, he would… if he actually had the time or energy to cook on his days off. I have to bite my tongue, because I know the profession is painted to the public as incredible and exhilarating. And many parts of it are. When I first started dating my partner, I would smugly introduce him to family and friends while citing his job. Even now, it seems to be such an intrinsic part of him that I need to actively remind myself that what he does is not who he is. But now, I know first-hand the reality of being in a relationship with a chef, and that gives me some idea of what it is like to actually be a chef. Twelve-hour days as a chef are a minimum- they often head towards fifteen. Every minute of those fifteen hours is filled with intense pressure, extreme concentration and the pursuit of perfection. Meal breaks are short, and forget coffee breaks! After six hours of prep work comes nightly service with the pressure that entails. Customers now expect perfection. We are so blessed with our food culture, but the result is an extremely high standard which leaves little room for error. And when that error occurs, chefs don’t forget. They’ll be thinking it over at 3am after service, working out how to ensure it doesn’t happen again. The "pressure" put on contestants in pressure tests is similar to the pressure they&apos;ll face on the job. Image: Channel 10. If you date a chef, you have to be committed. And resilient. Anything less and it’s so hard for a relationship to survive. Because why else would you put up with the being woken at 1am when you have work at 7am? It took me a long time to adjust to his hours, and it is still an on-going education. We don’t have children yet, but his career has had a serious impact on the way we will approach having kids. And shout-out to the chef partners out there who already do it! The gym you love to go to on Saturday morning, or yoga session you head to after work to reset? Those are rare luxuries for chefs, and if they are maintained seriously, it is only through sacrificing sleep. I believe this causes men and women become just ‘chefs’ and not ‘people’- they barely have time to do anything else. Knees, backs and necks all suffer from long hours leaning over kitchen benches. Arms, hands and fingers get cut and burnt. Feet ache and muscles knot. And, like other professions, a chef’s body is their livelihood- an injury to any one part can be catastrophic. "Men and women become just ‘chefs’ and not ‘people’- they barely have time to do anything else." Image: Channel 10. Some days, when my partner walks through that door after an eight-day stint, I know it’s not going to be the wonderful night I’d hoped we would have together. Some nights, they just can’t let go of what they messed up, or what another chef did wrong that took three hours to repeat. They’re exhausted, and grumpy, and pumped full of adrenalin that won’t seem to abate. Most people know that drugs and alcohol are huge issues in the hospitality industry. My partner never partakes in the first, and very rarely in the second. But the huge hours, high pressure and isolating nature of the work is a hot bed for these behaviors, and many a good chef has come undone from them. My partner is extremely blessed to work in the kitchen he does - the treatment of staff and respect amongst the team is world-class. But we’ve all seen Gordon Ramsay screaming at some innocent, and this is all too common in kitchens. How anyone is expected to work at their best while being belittled and humiliated in front of their colleagues is beyond me, but we’ve all heard the horror stories. People make fun of Masterchef&apos;s elaborate challenges, but they&apos;re not far from the truth of working in a commercial kitchen. The huge hours, strict rosters and difficulty getting time off as a chef can be extremely isolating. Often their family and friends work normal 9-5 jobs, which makes catching up a marathon effort. This can lead to a very isolated existence, feeding mental health issues such as depression, a vastly unspoken issue in hospitality. We all know chefs aren’t saving the world by creating a new dish. There are doctors, paramedics, nurses, countless other professions that put in the huge hours and commitments that chefs do. And these people and their families deserve respect and praise for their sacrifices as well. But chefs do make the world a little more beautiful. They make coming together over a meal a memorable experience. They create the setting for your grandma’s 80th birthday lunch, or the dinner that your boyfriend proposes to you. They craft celebrations. Food is an incredibly connective activity. But when we are scoffing down a meal we were just served, take a moment to think of the chefs out the back. Chances are, they’ve put time, sweat and even a few tears into the dish you just consumed. Their wives, children and families have all sacrificed for the spread you just enjoyed. Willingly, happily, sometimes a little begrudgingly. Because being a chef is very rarely easy, but for the people who do it, the rewards are phenomenal.